Erla Jocelyn Friesen (nee Klaassen) age 78, went to be with her Lord on Monday, June 18, 2018. Erla was predeceased by her parents, Daniel & Tina (Katie) Klaassen; her brother & sister-in-law, Ormond (Judith) Klaassen; a nephew, Mark Roberts; her parents-in-law, Peter & Helena Olfert; brother-in-law & sister-in-law, Jake & Elsie Friesen; and by her brothers-in-law, Dan Friesen, Elmer Friesen, and Harvey Friesen. She leaves to cherish her memory her husband of 54 years, Harry; her son, Darren (Sherryl) Friesen – grandchildren, Dylan, Madison, and Brock; her daughters, D’Lores (Mike) Talaga, Darci (Clint) Guenther; her siblings, Della (Bill) Roberts, Doyle (Lucille) Klaassen, Fern (Ivan) Prefontaine, Jewel (Rick) St. Laurent; many nieces and nephews, and a large step-family. Erla was born on April 25, 1940 in Beaver Flat, SK, and grew up on the family farm in Beaver Flat. She received her education at the Turnhill School, and lived on the farm until the age of 17. Erla met Harry in 1962 while attending Miller College of the Bible. He proposed on the day of her graduation, and they were married in 1964. In 1967, they welcomed a son, Darren, who was followed in 1968 by D’Lores, and Darci in 1970. Erla worked at Charmaine’s Ladies Wear and the Palliser Regional Care Center until her retirement in 1997. Erla’s commitment to her Lord sparked years of dedicated service to all who knew her. She loved to have people over for coffee or a meal. Many people called Erla & Harry’s house their second home, whether traveling or on furlough from missionary work. She loved helping others from behind the scenes. When Erla wasn’t playing hostess, she filled her time by crocheting, gathering family history, and spending hours keeping in touch with family and friends on the phone. Erla loved her husband and children so much. She was especially proud of her grandkids. Our family is heartbroken and filled with grief at the loss of someone who was not only our rock of support but also our sounding board and our prayer warrior. Although we know that she is with Jesus, we also know that we will miss her immensely. 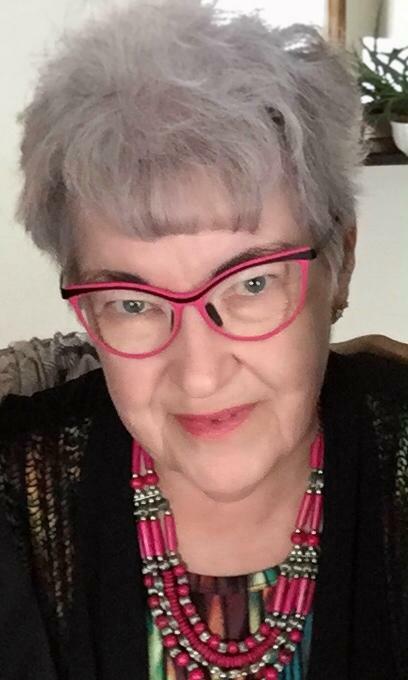 The Celebration of Life for Erla Friesen was held on Saturday, June 23, 2018 at 1:30 pm from the Church of the Open Bible, Swift Current, SK with Pastor Josiah Boyd officiating. “When We All Get to Heaven” and “It Is Well with My Soul” were sung by the congregation under the leadership of Ron Olfert, with Trudy Olfert serving as pianist. Special music was brought by Darren & Sherryl Friesen and Nolan Balzer. Darci Friesen, D’Loras Talaga, and Darren Friesen gave the obituary. Tributes were given by Doyle Klaassen, Fern Prefontaine, Jewel St. Laurent, Dylan Friesen, Madison Friesen, and Brock Friesen. A photo presentation was given, Scripture was read by Roxy Dyck and Janet Neubauer (Romans 8:35, 37-39 and Psalm 23). The ushers in the church were Stan Klassen and Robert Klassen. The Interment Service was held following the Funeral Service from Hillcrest Cemetery, Swift Current, SK with Cameron Laurent Metweyash-Katchiwe, Todd Klaassen, Michael Friesen, Sachia Longo, David Klaassen, Katie Klaassen, Cori Longo, Barb Corbeil, Arverd Dyck, Lionel Neubauer, and Sharon Pettem serving as Pallbearers.